Do you have a few extra bucks laying around that you’ve been trying to find a use for? 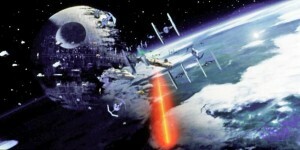 Why not build your own Death Star? According to a blog run by Econ students at Lehigh University and posted on Centives, building Darth Vader’s planet destroying mega weapon would cost “roughly 13,000 times the world’s GDP” and would require so much steel — writing the amount uses 15 zeroes — it would take more than 833,000 years to produce it. The second-best thing to owning an intergalactic weapon? Reading the counter-arguments in the Centives article’s comment section. We are not insensitive to the eco unfrienly material needs of building the Death Star and instead propose creating the VR world of Tron? Should be a lot less steel! How much plz?